Visual Fare Food Styling provides beautiful and experienced food design and food styling for high-impact advertising including print material, editorial, cookbooks, magazines, packaging and fine art. When the job requires, Trace can also provide the services of his assistants. For fast paced commercial work, maximum shots per day and unsurpassed progressive food styling, this is the team to have on set and can handle every type of food styling for print, packageing, feature film, T.V., commercials, video and the world wide web. With some ingenious adaptions for film, Trace can create a wide array of special effects using his own smoke machines, custom steam apparatus for all types of foods, special techniques for controlled splashes, pours and perfect pulls. Armed with a streamlined and progressive styling kit, Trace can style food anywhere on the planet that has an electrical outlet and works in the Dallas Metroplex, Austin, San Antonio, Houston, Tx., Las Vegas,Nv., Denver, Co,. Minneapolis, Min., Little Rock & Bentonville Ark, and beyond. Being a Master Food Stylist requires special tools. Throughout his career, Trace has been crafting specialized tools and equipment to address the very specific needs of food stylists and food photographers. One of these inventions has been Twice as Nice Ice. Fake acrylic ice has been around for years, but the shape and size of this ice doesn't work for high-end, closeup, drink images. As a highly requested drink stylist, Trace has created and perfected natural looking fake ice. 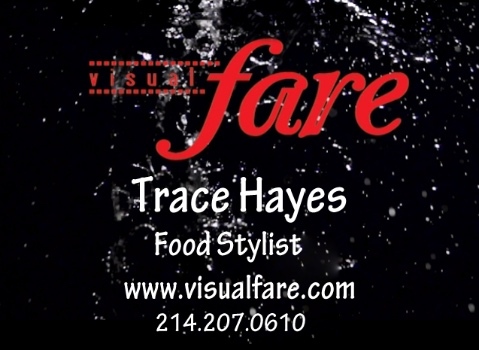 Take a look at the Visualfare store for images and information.